The US, the UK, Russia, China and France are rebuilding or upgrading their arsenals of nuclear weapons. The other four nuclear states(Pakistan, India, Israel, and North Korea) too are ‘improving’ their arsenals. As we discuss the statistics and strategies of ‘nuclear arsenals’ and ‘nuclear deterrence’ it can be hard to keep in mind the reality underlying the abstract discussions. The nine nuclear states have over 10,000 nuclear weapons in their stockpiles1. This is enough to wipe out the entire population of the planet many times over together with all other life forms. Is this sane? Has the human race lost its senses? 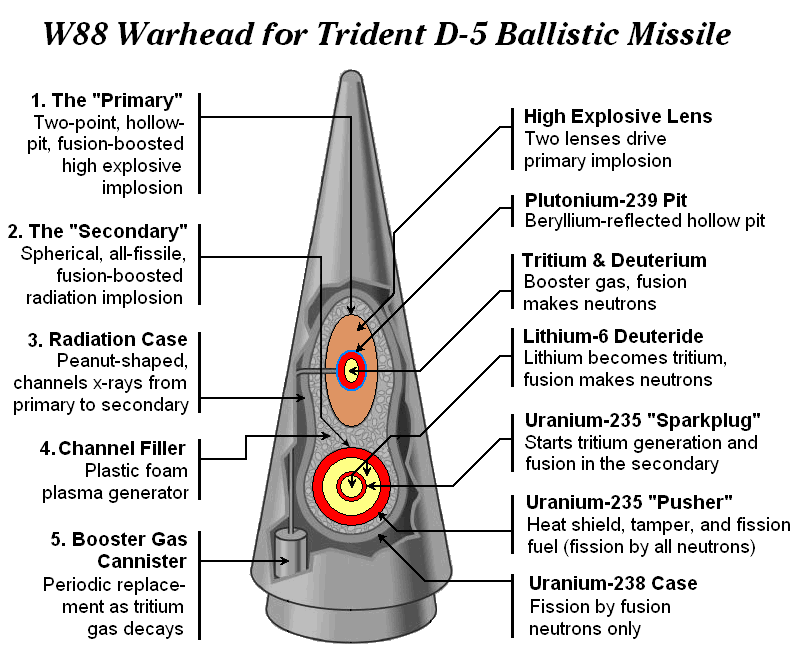 A single United States thermonuclear warhead, designated W88, has an estimated ‘yield’ of 475 kilotons2. The ‘yield’ is the destructive power expressed in tons of TNT equivalent. A single W88 could completely destroy London, Moscow or New York. Each bomb on a major city would kill millions of people; women, children, babies, old people, everyone. The suffering would be indescribable and for many would go on for months and years before death. No emergency services could begin to cope There would be no relief. What sort of people would do such a thing? What kind of human would threaten such an atrocity? The US government has 5 nuclear submarines on patrol at all times carrying 1000 times the destructive power of the Hiroshima bomb3. Is it possible to imagine the degree of paranoia represented by such a standing threat? The UK government has started to spend one hundred billion pounds on rebuilding its Trident fleet of nuclear submarines, each one with the capacity to incinerate over 40 million people. This is being done at a time when many citizens are suffering from inadequate defences against flooding and when the social services are being radically cut back. The situation is being rendered even more dangerous by the US and Russia who keep 1,800 weapons on high alert atop long-range ballistic missiles that are ready to launch 5 to 15 minutes after receiving an order! It is ironic that the worst offenders are the five permanent members of the ‘Security’ Council of the United Nations. They have had 69 years to get rid of their nuclear weapons while all that the citizens of the world hear from them are windy speeches around purported good intentions which never come to fruition. Citizens of the world have simultaneously become aware that the nuclear states do not intend to get rid of their nuclear weapons and that their existence imposes a permanent and intolerable threat to us all. The existence of nuclear weapons means they could be used by accident, by misunderstanding or by malicious intent. How can we ever be sure that some deranged psychopath will not gain power in one of the nuclear states and deceive him/herself into believing that it is in their best interests to make a first strike? How can we ever be sure that some terrorist organisations will not hack into the electronic control systems and carry out the launching themselves? And we now know that even a small nuclear exchange could be a lethal threat to everyone on the planet. In a limited nuclear war between India and Pakistan 20 million people would die from the nuclear blasts, fires, and radioactive fallout. And the fallout would have global consequences that would kill millions of people, disrupt climate patterns, and threaten global agricultural collapse4. And finally there is hope. The huge burgeoning of awareness in the citizens of the world is bearing fruit. There are 9 nuclear states and there are 183 non-nuclear states. The security of the non-nuclear states is threatened by the irresponsible and self-focused behaviour of the 9 others. But these 9 are outnumbered by 20 to one. The non-nuclear majority which do not feel the need for a lethal ‘security’ crutch have decided to take the initiative. And rather than focus on the numbers and ‘yields’ of the weapons it was wisely decided to concentrate on the effects on humanity of the use of nuclear weapons. The next logical development, as the nuclear states continue to deny their obligations to shed their arsenals, is for the non-nuclear states to proceed independently to enact a treaty outlawing these weapons internationally. By focusing attention on the humanitarian consequences of their use they are well on their way to doing so. The first International Conference on the Humanitarian Impact of Nuclear Weapons was held in 2013. Humanity owes a great debt to Norway for this initiative. This ground-breaking and historic conference was attended by delegates from 127 countries and 70 nongovernmental organizations. The nuclear states were invited but declined to attend. It is not easy to face up to the implications of these arsenals especially if you bear the primary responsibility. India and Pakistan sent observers. After hearing presentations from a wide range of experts on the various effects of nuclear weapon detonations the conference concluded that “it is unlikely that any state or international body could address the immediate humanitarian emergency caused by a nuclear weapon detonation in an adequate manner and provide sufficient assistance to those affected.” Conference members also agreed that the effects of a nuclear weapon detonation will not be constrained by national borders but will produce significant negative regional and global effects6. Mexico offered to host a follow-up meeting to this conference and such is the vital importance of this approach that other states declared their intention to organise additional events on this subject. The Second Conference on the Humanitarian Impact of Nuclear Weapons was held in Nayarit, Mexico, on 13 and 14 February 2014. It included delegations representing 146 States, the United Nations, the International Committee of the Red Cross, the Red Cross and Red Crescent movement and civil society organizations. The powerful summary statement of the conference Chair pointed out that the broad participation of states and civil society reflected the burgeoning awareness that this issue is of the utmost importance to all the peoples of the world. Due to ‘…proliferation, the vulnerability of nuclear command and control networks to cyber-attacks and to human error and potential access to nuclear weapons by non-state actors, in particularly terrorist groups’ the risks are ‘growing globally’. The Third Conference on the Humanitarian Impact of Nuclear Weapons will be held in Austria later this year. The movement for an international ban is unstoppable. The International Campaign Against Nuclear Weapons (ICAN)8 is a coalition of over 350 organisations in 90 countries. Ray Acheson, in her closing statement on behalf of ICAN to the Second Conference included the words ‘The claim by some states that they continue to need these weapons to deter their adversaries has been exposed by the evidence presented at this conference and in Oslo as a reckless and unsanctionable gamble with our future’. She went on to explain that the use against cities of less than one percent of existing weapons would put billions of lives in jeopardy and have a long lasting detrimental effect on both the planet’s climate and agriculture. She insisted that we must act to get rid of them or they will be used by accident, misunderstanding or malicious intent. Getting rid of them will take courageous leadership by states but such leadership will have the support of civil society. She concluded ‘It is time to change the status quo. It is time we ban nuclear weapons. So with these and other major forces at work there is an unstoppable movement towards banning these Armageddon machines. The nuclear states have become a sorry sight. Frozen in a realm of outdated thinking which was always inhuman; their leaders frightened and paranoid and prepared to put the survival of humanity in jeopardy simply in order to feel important and powerful as they strut, uncomprehending, on the world stage. Their brief and nightmarish ascendancy is over. The world has moved on.